The Lakeside Collection 24'' Remote-Controlled Outdoor Wreath by The Lakeside Collection at Two Clock. Hurry! Limited time offer. Offer valid only while supplies last. Dress up your porch with this 24'' Remote-Controlled Outdoor Wreath. 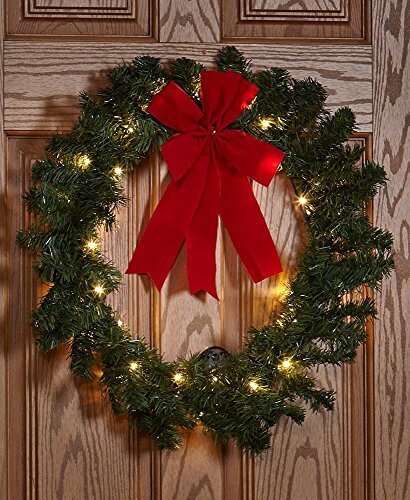 The faux evergreen wreath is trimmed with warm white lights and a big red bow. Dress up your porch with this 24" Remote-Controlled Outdoor Wreath. The faux evergreen wreath is trimmed with warm white lights and a big red bow. The lights have 2 modes, flickering "candle" or steady on and 2 settings, dim or bright. The 24" has 40 lights. You can control the lights by hand or with the remote, which also has a timer function that will turn the lights off after 2, 4, 6 or 8 hours. Requires 3 "AA" batteries. Metal and PVC.